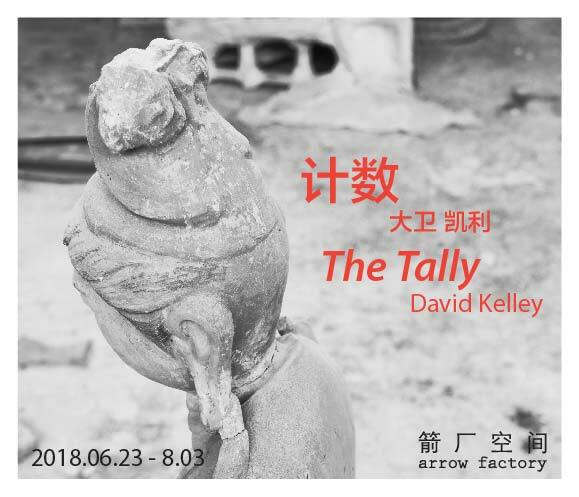 Arrow Factory is very pleased to present The Tally, a new photo-video installation work by Los Angeles-based artist David Kelley. Developed during a residency at Dunhuang’s Mogao Caves*, The Tally muses on the currencies of facsimile and ledgers of our psychosocial profiles. Exploring implications of duplication, Kelley presents a large-scale portrait—a photograph of an advertisement found in the window of a hair salon—taken at the moment that a live mosquito landed on the surface of the glass. During daylight hours, the portrait stares out beyond the viewer. After dark, a video projection of Mogao cave paintings sweep over the portrait, a moving searchlight that appears to scan beneath the surface of the woman’s placid visage. Changing from day to night, The Tally transforms everyday at dusk from a single photograph to a montage of the portrait and the medieval Budhhist paintings. Exploring themes of capital, value and copying, The Tally collapses multiple streams of image making onto a single surface making it unclear what remains of the original after its transmission into its mimetic and allegorical form. While at Dunhuang, Kelley witnessed the meticulous reproduction of the Mogao Buddhist caves, a faithfulness that saw artisans replicating even bits of graffiti carved into the walls by White Russian prisoners detained in the grottoes by the local authorities while fleeing the Russian revolution. The existence of the replica questions the very currency of what it represents, as the copies are exhibited, photographed, re-staged and WeChat-ed over various platforms in distant venues across the globe. What is a duplicate worth? Are such allegories on a gold standard? As bodies, sites and times are abstracted, digitized, coded, electrified, and made immaterial, do they become pure medium? Is this something like Enlightenment— in the Buddhist sense, a state of pure immanence—where one is both there and nowhere? And yet, who is ever there, in that nowhere, as speed and limitations leave us fumbling to relay these streams of images that convey our feelings and attentions to one another? The closer we get to this immaterial state of being, the faster things appear, the higher the resolution of images rendered, the more cryptic currency becomes, the ledgers of our psychosocial profiles become more distributed. Meanwhile, the clay and pigment caves in Mogao continue to age, dessert sands are swept off the tourist paths at Mogao, and the mom and pop businesses in the Beijing hutongs around Arrow Factory are rapidly bricked up and cleaned up to turn the capital into an image of itself. David Kelley (b. 1972, Portland, USA) earned his MFA at the University of California in Irvine, and is an alumni of the Whitney Museum’s Independent Study Program. He is currently an associate professor in video and photography at the University of Southern California. Kelley has exhibited at Museum of Modern Art in New York, White Box in Portland Oregon, and Commonwealth and Council in Los Angeles. Other recent exhibitions include The Bank in Shanghai, New Art Center, the de Cordova Biennial in Boston, BAK in Utrecht, MAAP space in Brisbane Australia, and the Jim Thompson Art Center in Bangkok. He lives and works in Los Angeles.